Is Republic day in India a public holiday? Republic day in India 2019 falls on Saturday, the 26thof January. As with every day of national commemoration, India Republic Day 2019 is also a public holiday. 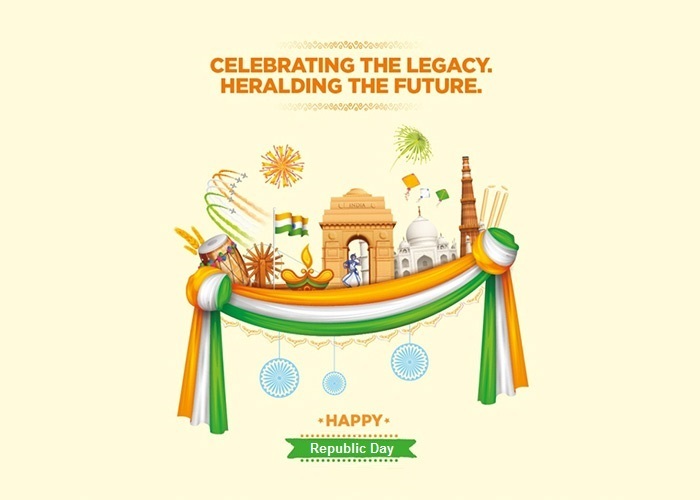 Republic day is enlisted as a gazette holiday in the official holiday calendar of the Government of India. National, state and local government offices, post offices and banks are closed on this date. With celebrations pertaining to the official day of adoption of the Indian constitution a mass affair throughout the country, India Republic Day 2019 will as always be a public day of celebration. What is the meaning of Republic day in India? India Republic Day 2019 would mark the seventh decade of commemorating the day which brought the Constitution of India in force. On 26thJanuary, 1950, the Constitution of India came into effect replacing the 1935 Government of India Act as the abiding document of the country. Republic Day in India 2019 would therefore be the honouring of the country’s supreme authority, the Indian Constitution as part of the 70thanniversary celebrations. Interestingly, the Indian constitution was adopted much before 26thJanuary 1950. Two months before, on 26thNovember, 1949, the Indian Constituent Assembly adopted the Constitution. However, the authorities decided to make the ideals of the Constitution enforceable only from the 26thof January, 1950. Therefore, India’s transition into becoming an independent republic was initiated from the 26thof January, 1950 when the Constitution of India was implemented. The reason behind choosing to enforce the Constitution on this very date was that it was on 26th January two decades before in 1930 that the Declaration of Indian Independence was proclaimed by the Indian National Congress. This declaration of complete independence or Purna Swaraj was in stark opposition to the provision of Dominion status offered by the British rulers. India had been under the oppressive British regime for almost 200 years since 1857. Finally on August 15, 1947, when the country attained independence through non- violence and civil disobedience, it surely marked the dawn of a new era for India. However, even with its freedom, India was still largely under the influence of the English rulers. As a constitutional monarchy, India had George VI as the head of state and Earl Mountbatten as the Governor General. The country, however, was yet to have a permanent constitution. Free India continued to be governed by the modified colonial Government of India Act 1935. It was only on 28thAugust, 1947 that the Drafting Committee was formed to draft a permanent Constitution.With Dr B R Ambedkar as the Chairman, the Committee set into action in full swing and a draft constitution was prepared by the committee. The draft was submitted to the Constituent Assembly on 4 November 1947 and after a period of three years of open deliberation, the Indian constitution was adopted on 26thJanuary, 1949. Indian Republic Day celebrates the coming into force of the constitution a year later from 26thJanuary, 1950. Official India Republic Day celebrations since 1950 has been held in the national capital, New Delhi, at the Rajpath before the President of India. Since then, India has also been hosting head of state or government of another country as the state guest of honour for Republic Day celebrations. India Republic Day 2019 will witness South African President Cyril Ramaphosa as the Chief Guest. Indian Prime Minister Narendra Modi had invited Ramaphosa to grace the 2019 Republic day celebrations in India as Chief Guest when the two leaders met on the sidelines of the G20 summit in Argentina’s capital Buenos Aires. However, the choice of Chief Guest to be invited for the India Republic Day celebrations isn’t just a matter of sorts. The guest country is chosen after a deliberation of strategic, economic and political interests that India shares with it. The India Republic Day 2019 celebrations are also significant in that this year also marks the 150thbirth anniversary of the Father of the Nation, Mahatma Gandhi, the architect responsible for scripting India’s freedom struggle. Ramaphosa as the Chief Guest at the 2019 India Republic Day also marks a remembrance of the close link that the Mahatma had with the South African nation. Interestingly, the decision to invite the South African president as the Chief Guest comes after US President Donald Trump declined the invitation for the same. Citing “scheduling constraints” for Trump not being able to make it to the grand event, the White House had however emphasized that Trump and PM Modi enjoy “a strong personal rapport”. On January 26, 1950, the Indian constitution came into effect, making the Republic of India the most populous democracy in the world. However, the period preceding the day when India became a republic was one of tumult and strife. Following from the time when the nation began its march towards independence, the British rulers made every attempt to ensure that India as a country was left only a poor image of its former self. Finally when India became an independent nation on the midnight of 14thAugust, 1947, the country was virtually a ground of strife torn violence. In order to move forward as an independent republic, it was necessary that the country had its own Constitution in place. The Indian constitution was very much a necessity for the nation to emerge as a strong and free nation. It was in such a backdrop that the specially formulated Constituent Assembly drafted the Indian Constitution by taking into reckoning some of the most notable of constitutions from around the world. After intense sessions of discussion open to the public, when the draft Constitution was subject to scrutiny and debate, the Constitution was fully enforced on 26thJanuary, 1950 and since then India became a true republic. How Indian celebrates republic day? Republic Day celebration in India is a grand affair. At the main celebration held at Rajpath in Delhi, ceremonious parades are performed as a tribute to the rich cultural heritage and unity in diversity of the country. The Ministry of Defence organizes the Republic Day Parade in the national capital. The ceremonial parade commences from the gates of the Rashtrapati Bhavan (which is the official residence of the President of India) on Raisina Hill along the Rajpath past the India Gate. Every part of the country is represented in the India Republic Day parade in a rich show of the nation’s diversity. The nation’s defence capability as well as its cultural and social heritage is sought to be showcased with this annual parade. The Indian Army, the Navy and the Air Force march with their bands in all the finery and official decorations through the parade. The Indian President who is also the Commander- in- Chief of the Indian Armed Forces takes the salute. Along with the military forces, twelve contingents of various para military forces of India and other civil forces also take part in this parade that is an integral part of the Republic Day celebrations in India. While the main parade sums up much of the India Republic Day celebrations, there is still another parade that is held after officially denoting the end of the Republic Day festivities. Conducted on the evening of 29thJanuary, the third day after the Republic Day, this is the Beating Retreat parade that is performed after officially denoting the end of Republic Day festivities. The Indian President is the Chief Guest of the Beating Retreat ceremony who is given the National Salute with the playing of the National Anthem. Vijay Chowk or the victory square, Delhi, with the majestic background of Rashtrapati Bhawan is the venue for this parade. On the occasion of the India Republic Day celebrations, Google also puts up a commemorative doodle to mark the celebrations. The grandeur of the day’s celebrations in India therefore marks a extensive observance of events. While celebrations in the national capital centers around the Republic Day parade, observance of the Republic Day in India is also significant for a few other events. The most important being the conference of the Bravery Awards on the eve of the significant day. Celebrations on 26thJanuary, 1950 will, like previous years, begin with the Prime Minister of India placing a floral wreath at the Amar Jawan Jyoti memorial at India Gate, in memory of those soldiers who lost their lives in war. This is followed by two minutes silence which precedes the official celebrations with the commencement of the parade.